What’s your reason for falling in love with horses? 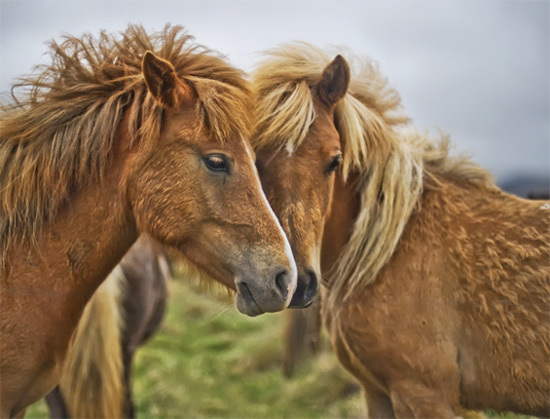 awwwwww… One of my reasons for falling in love with horses “the only creature that has bangs similar to a human”. Thinking about it.. what other animal has a ‘hair’ like appearence on their heads than equine? Another reason “The trust that can be earned between predator (human) and prey (horse).” It takes bravery from both sides. A human could easily be crushed by a horse and a horse know by instinct that a human is capable of being a predator. Cute picture!You’re right horses are cozy.Great blog. I do love it when my horse gets all fuzzy in the winter. When I slide my hands under her mane it warms up my cold hands. And that photo is so sweet! awwww! I can’t remember the moment I ‘fell’ in love with horses. My mom use to love them too so I guess it was in my blood. I admire their power, beauty, intelligence, and personalities! I just love horses! Do I need a reason? The reason I fell in love with horses is because of how beautiful, amazing and powerful they look. I also feel its an instict inside me, ever since I was a toddler I have loved horses and I haven’t stopped loving them since. I think horses bring you the scene of love, reassurance and understanding. If your down you can hug them and talk to them and they can comfort you in a way. Well, it’s officially bit-warming season in my little corner of the world,too. I fell in love with horses because my ten-year-old-self was shy and quiet; they gave me someone to talk to and something to talk about. The ponies are adorable. Love them! i fell in love w/ horses because i needed someone who would understand me. i didn’t realy have any friends to tell my secrets, and i didn’t have any pets. I fell in love with horses when my dad told me storys about when he had horses. And I started dreaming of the day I would have my very own horse.and my mom told me she always loved horse when she was a kid but never got to be around them. I have always been shy so Animals have always been there for me. when ever I’m upset I go to my horse cat and just stand by her pet her, (along with a few dogs and cats running around me) that will Defiantly put that frown upside down. I love the sweet picture! I have horses in my blood. It set in when I was about five. There is something in a horse’s eyes that just makes me melt, and everything about horses I love. It’s hard to explain exactly why horses are my favourite without thinking deeply. Does it matter, if you just know you love them? I think explaining why we fell in love with horses is like explaining why we breathe. It’s too hard to find all the reasons but it’s such a simple concept of love. Horses are just amazing with such beautiful characters. They have this ability to change you for the better and take your worries away (as cliched as it sounds). But what’s more is how much you need to give in order to gain their trust, and I think that this is largely why I fell in love with horses. This may sound strange but one of the reasons I love horses is for their memory.I’ve heard they can remeber as much as an elephant.It’s nice to know that even if you haven’t seen a horse in a while,they still can remeber you. “Its one thing to ‘simply’ love the horse, but its another thing to actualy know a horse”. -my riding instructor. I love my Midnight, my western horse, because shes taught me that horses dont ‘love’ in a sentimentatly kind of way like humans do. They have bonds but they are built on trust and leadership. Midi has taught me or either demanded of me that I either be leadmare or submit to her. I’m still working on gaining her trust but its easier for me to be more firm and not worry if im ‘hurting my horse’s feelings’ cause trust me they don’t learn by soft little ‘no no horsey don’t do that’. A horse is a beautiful animal but they are not to be taken likely. They are strong animals of power and agility and one of God’s forces not to be reconned with. I think we let our sentiments get in the way somtimes of common sence. I don’t want to sound harsh or anything but I love horses because they are sensible and don’t take to human foolishness. aww they look soo plush like my cat lulu! Horses are like peace for me. When I need to escape, I just run out to the barn and bury my face in their fuzzy necks; when I need to cry, my horse’s fur soaks up all of my tears. When i think about it, i’ve always loved horses. So this is just one big thanks to everyone! one more answer that ive thought about… when ever im away from horses I feel drained.. empty and there is a bit gap in me. When I’m with my horses I feel, I see, and I hear “the sound of silence”. Its hard to explain but its a certain type of peace and calm I do not have anywhere else. I can pray here, and I can talk, cry, and laugh here without any interuption or hinderance.